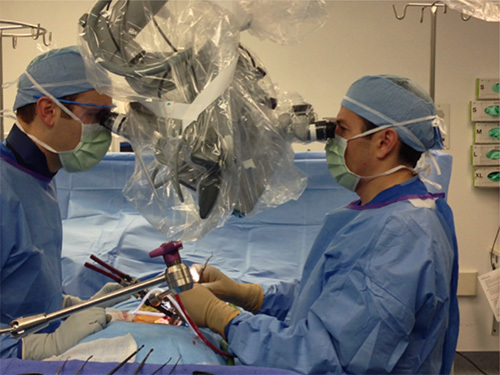 Dr. Edward Perry is uniquely trained in the removal of spinal tumors. 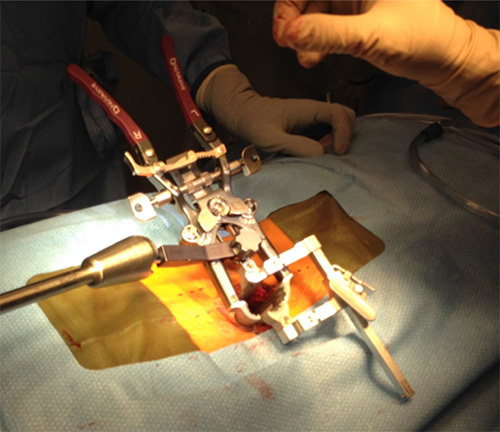 He is able to remove spinal tumors through very small incisions that minimize tissue trauma. 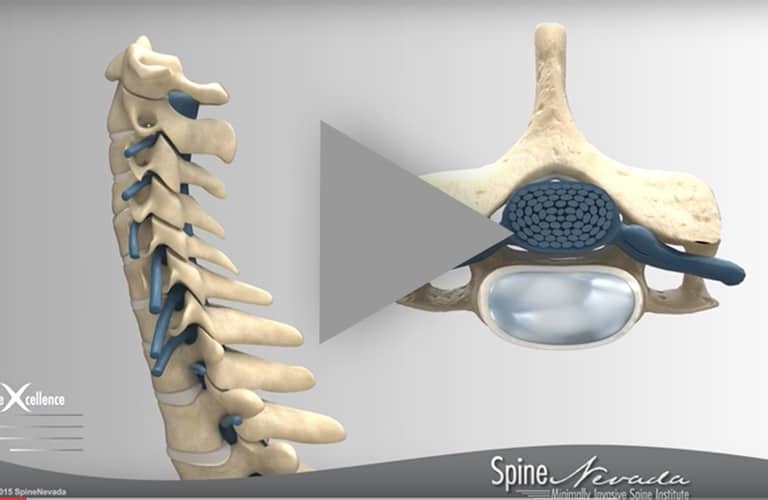 What is the difference between minimally invasive surgery and open surgery for spine tumor removal? 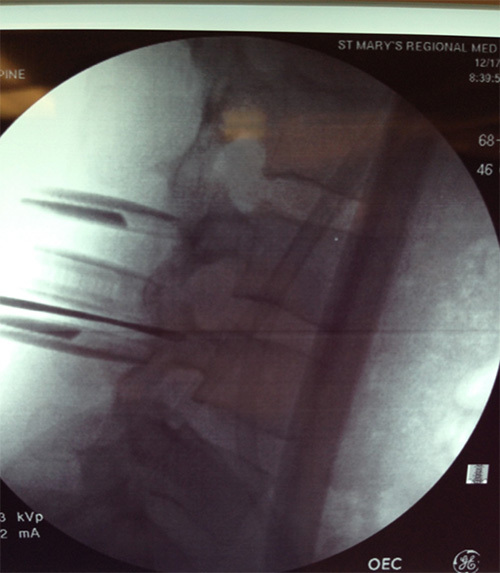 The minimally invasive spine surgery techniques in use by Dr. Perry can allow quicker post-surgical recovery and return to activity than traditional open spine surgery approaches. With an open spine surgery approach, the surgeon makes a larger incision that usually results in trauma to surrounding tissues. Because of this, the affected tissues and muscles need adequate healing time that is longer than that of a minimally invasive surgery approach. 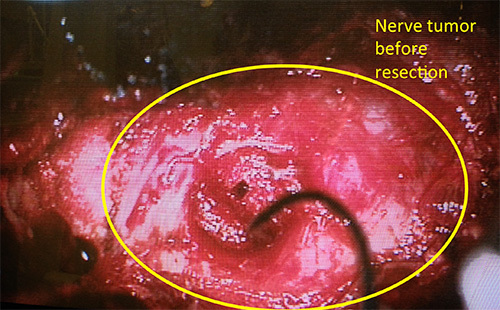 In the images following, a 30 year old patient was diagnosed with a large two inch nerve tumor. The spine tumor was causing weakness and numbness in his quadriceps. 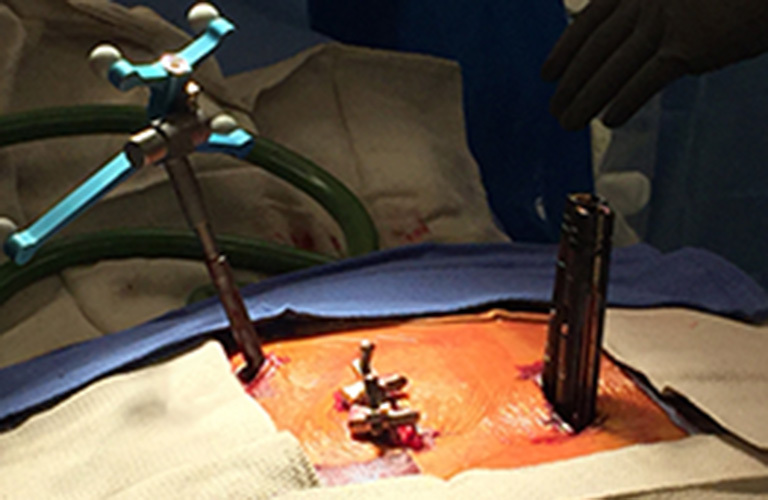 The patient visited another institution where the surgeon suggested the tumor be removed through a large open surgery and simultaneous back fusion. 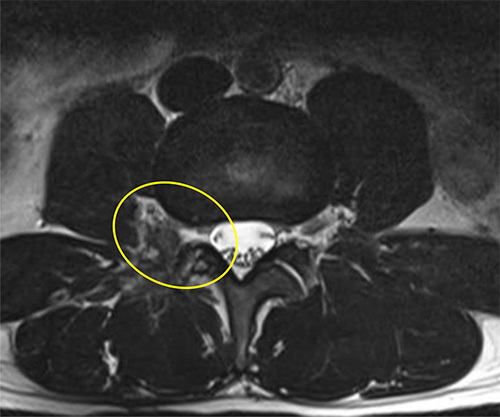 The spine tumor is demonstrated below on the pre-operative MRI. 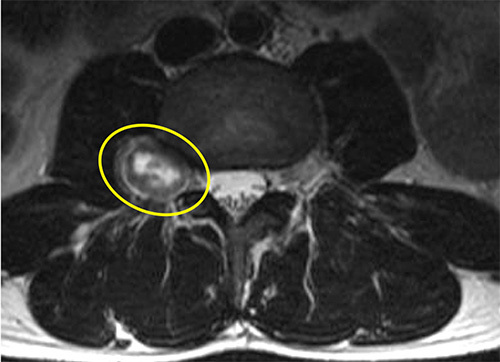 Spinal tumors that develop from the nerve roots that come off the spinal cord are known as nerve sheath tumors. This type of tumor (schwannomas and neurofibromas) is commonly benign and slow to spread. Treatment decisions in patients with spinal tumors are complex. The surgeon and patient will work together to develop the best treatment plan for each individual patient. 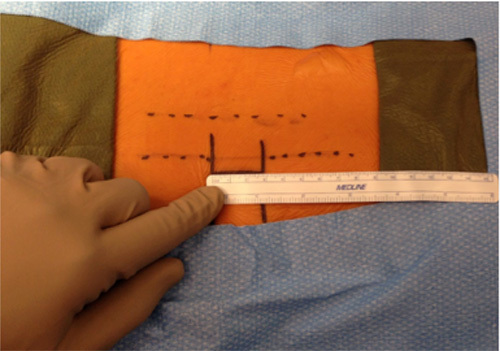 In the operating room, Dr. Perry draws out a very small incision under xray guidance. 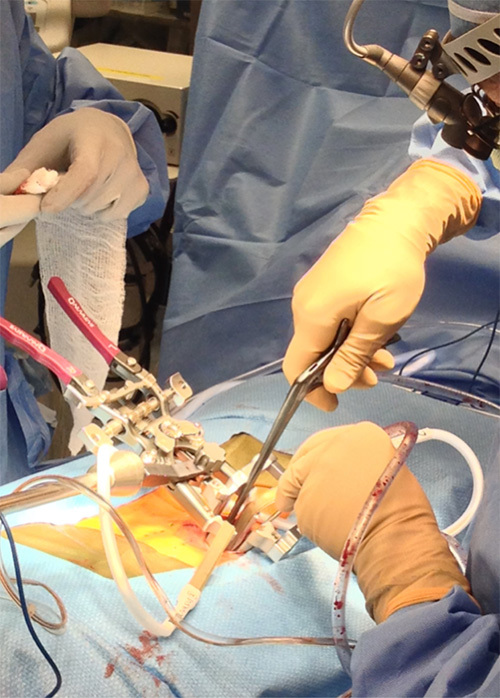 Dr. Perry will then use careful x-ray guidance to place a minimally invasive retractor — this allows the neurosurgeon access to the spinal tumor. Next, Dr Perry isolates the tumor, and then works under the microscope through the MIS portal to carefully resect the tumor. 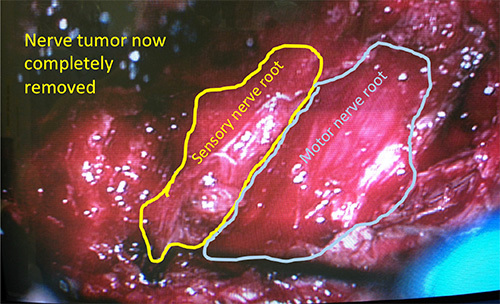 With careful dissection, the tumor is completely removed while vital nerve structures and function is preserved. 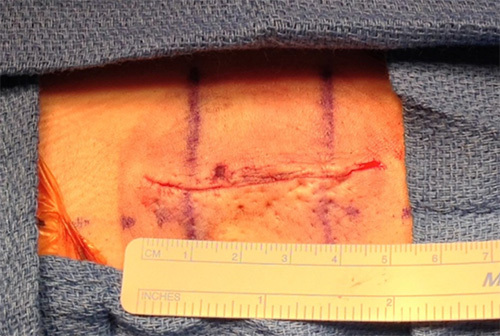 The patient in this case study didn't require a fusion due to Dr. Perry's use of MIS (Minimally invasive surgical) techniques. 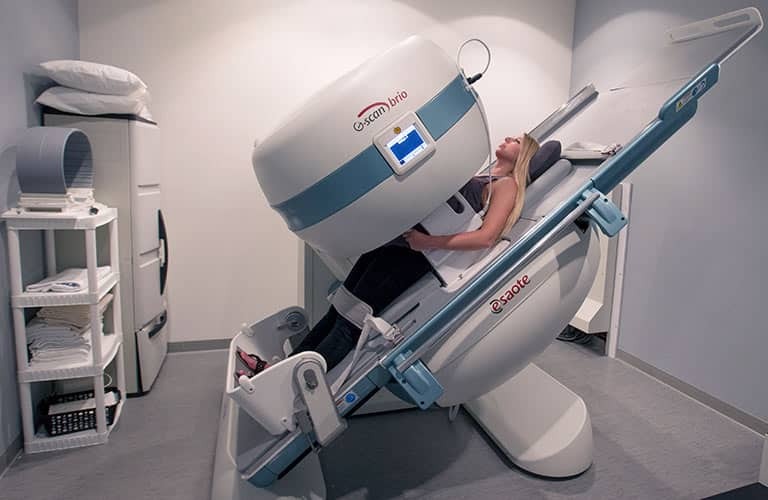 The patient regained all his leg strength and the post-operative MRI (below) showed no residual tumor.